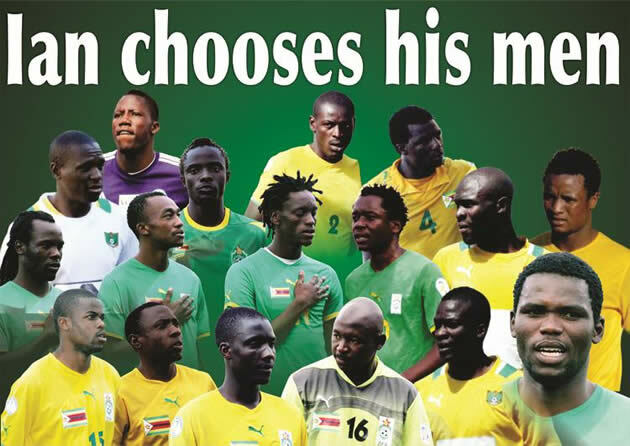 ZIMBABWE coach Ian Gorowa has blended youth and experience as he stuck with the majority of the players who have been doing duty under his reign when he named his final 23-man squad for the African Nations Championship in South Africa. The CHAN tournament will burst into life at Cape Town stadium on January 11 when hosts South Africa face Mozambique in a Group A game that would be preceded by the official opening ceremony. Zimbabwe’s Warriors, making their third appearance at the CHAN competition will begin their Group B campaign with a date against Morocco at Athlone the following day. The Warriors seeking a maiden dance with the knock out stage of the CHAN tournament will then complete their group assignments with clashes against Uganda on January 16 and Burkina Faso four days later with all their pool matches taking place at Athlone. Although an official announcement of the Warriors final squad is only expected to be made today, The Herald can reveal that Gorowa and his assistants Callisto Pasuwa, Mkhuphali Masuku, Gift Muzadzi and Richard Tswatswa opted to stick to the players that have d0ne regular duty for the Warriors since the former Moroka Swallows and Mamelodi Sundowns coach took over from German gaffer Klaus Dieter Pagels. With 27 players in camp for the last two weeks Gorowa and his lieutenants had to identify the four players that would have to stay behind as the Warriors head to Cape Town next week and the coaches opted for a blend of youth and experience in picking the side that will be under the captaincy of Dynamos defensive rock Partson Jaure. Gorowa wielded the axe on the Black Rhinos pair of striker Lot Chiwunga and midfielder Wonder Kapinda while there was also no place for Harare City goalkeeper Maxwell Nyamupangedengu and Shabanie Mine’s Frankson Bushire. There was, however, still a slot for rookie midfielder Pascal Manhanga of Triangle as the coach also took a futuristic approach to his selection. With the domestic Premiership suffering from a dearth of quality strikers, the Warriors would have to depend on the trio of Nelson Maziwisa, Simba Sithole of Dynamos and How Mine’s Simba Sithole to find the man who will lead the line of attack. But for all their striking deficiencies the Warriors are not short of some good midfielders with Charles Sibanda — playing in his second successive CHAN — Ali Sadiki, Kuda Mahachi, Danny Phiri, Masimba Mambare, Peter Moyo, Donald Ngoma and Tawanda Muparati all carrying enough potential to propel Gorowa’s men to glory. Manhanga might play a cameo role or might not even feature in the group games, but just being in the final 23 and featuring on stage that is bigger than the compact environment of Gibbo will certainly help the young midfielder to gain some experience. The Warriors might also not have had as many warm-up matches as they would have wished for with their latest bid to play Libya falling through after the North Africans reportedly failed to secure flights from Tripoli to Harare, but Zimbabwe are still expected to do well in their group. A date against Libya would have afforded Gorowa and his men to sample North African football given that their international friendlies have mostly been against southern and eastern African opponents. But with Raja Casablanca who provide the bulk of the players to the Atlas Lions having recently taken part in the Fifa Club World Cup, the Warriors would have used their opportunity in camp to learn a thing or two about the Moroccans. The Warriors have also had the opportunity of being together for a while with the core of the squad having played at the Cosafa Castle Cup in Zambia in July as well as in the CHAN qualifiers and the remainder of the doomed 2014 World Cup qualifiers. Following the announcement of the final 23, the Warriors took a break yesterday and will resume their final lap of preparations on Friday.